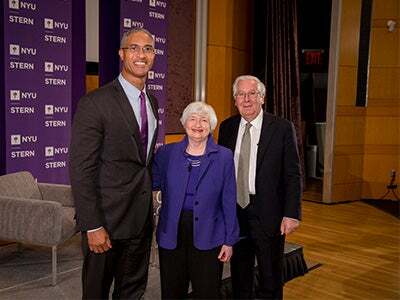 On November 21, NYU Stern’s “In Conversation with Lord Mervyn King” Series welcomed Janet Yellen, chair of the Board of Governors of the Federal Reserve System. Following an introduction by NYU Stern Dean Peter Henry, Chair Yellen and Lord King engaged in a wide-ranging discussion, touching on everything from the current state of the economy, her first day in office at the Federal Reserve, and the most interesting person she has ever met — her husband, economist George Akerlof. Significantly, the event took place the day after Chair Yellen announced she will step down as a member of the Board of Governors of the Federal Reserve System, effective upon the swearing in of her successor, marking one of her final appearances in her current role.